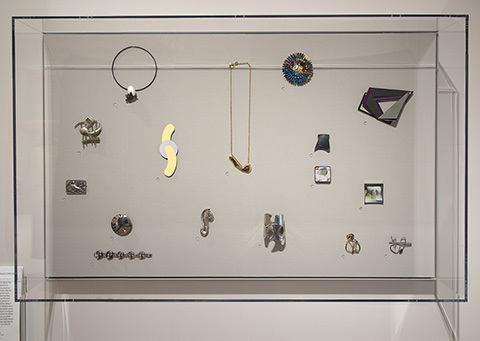 The Yale University Art Gallery is pleased to present an installation of 16 pieces of American studio jewelry from the 1930s to the present day, a promised gift of Toni Wolf Greenbaum. Greenbaum is a New York–based art historian specializing in 20th- and 21st-century jewelry and metalwork. 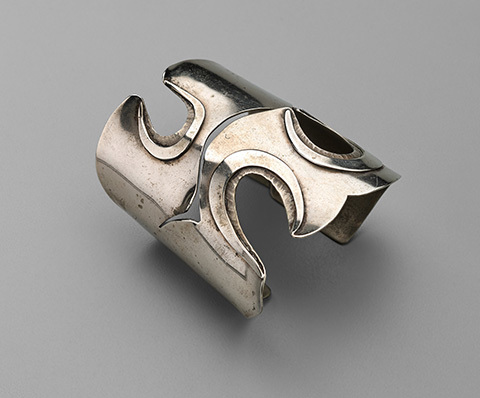 She is the author of Messengers of Modernism: American Studio Jewelry, 1940–1960 and is currently writing a monograph on modernist jeweler Sam Kramer. Greenbaum has lectured internationally and has curated exhibitions for several museums. She is also an associate professor at Pratt Institute, in Brooklyn, where she teaches a course in theory and criticism of contemporary jewelry. The works from Greenbaum’s collection—all of which she has worn and enjoyed—are installed in the galleries for modern and contemporary design, on the museum’s third floor. They expand upon the Gallery’s existing jewelry holdings, presenting further evidence of the vital role of jewelry within the context of 20th-century and contemporary American decorative arts. Studio jewelers design and fabricate one-of-a-kind or limited edition pieces in a studio, rather than factory, setting. The pieces on view are made from a variety of substances, including aluminum, brass, enamel, paint, plastic, repurposed objects, silver, and tin, and they demonstrate techniques such as hammering, chasing, assembling, anodizing, patinating, and mokume gane (a Japanese metalworking technique that uses mixed metals to produce a distinctive layered pattern resembling wood grain). The gift brings new artists to the Gallery’s collection, among them Harriete Estel Berman, Peter Macchiarini, and Art Smith.